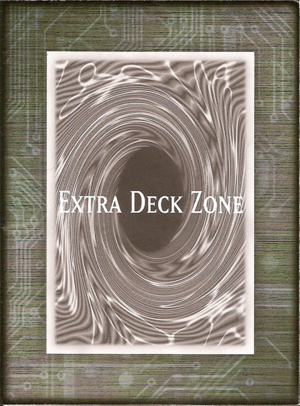 The Extra Deck Zone (Japanese: エクストラデッキゾーン Ekusutora Dekki Zōn, abbreviated ＥＸ（エクストラ）デッキゾーン in card text since Code of the Duelist), previously known as the Fusion Deck Zone (融（ゆう）合（ごう）デッキゾーン Yūgō Dekki Zōn), is where the Extra Deck (previously known as the Fusion Deck) is placed. It is located in the bottom left corner of the playmat. Game mats often depict the Extra Deck Zone as dark gray, or purple when it was called the Fusion Deck Zone. This page was last edited on 3 August 2018, at 06:10.